¡Muchas gracias por jugar a nuestro juego! Hemos creado esta guía para ayudarte en las funciones más importantes. ¡No dudes en preguntarnos algo si necesitas más ayuda! ¡Te invitamos a usar YouTube y otros servicios de Streaming para ayudar a otros usuarios a completar tus niveles! Guía en inglés. La traduciremos tan pronto como sea posible. ¡Disculpa las molestias! Spoorky is an adventure game, but it's also a global community with shared content across all available platforms. You'll be able to continue your game in multiple devices (Steam - macOS, Windows & Smartphone - iOS, Android), the Steam version includes some exclusive features (achievements, Steam community, screenshots and forums). In any case, you'll need a Spoorky account to play this game. Continue: select this one if you already have a Spoorky account. Game are shared and can be continued in all the compatible devices. You'll need your user ID and your Spoorky password. New game: select this one if you don't have a Spoorky account. You'll be playing in two shakes of a lamb's tail! If you chose New game, you'll need to complete two easy levels in Training Mode before you get access to the online content. There are some kinds of input settings in Spoorky, you can try them all and use which best fit for you. All these modes are continuously enabled: you can alternate them automatically. In mobile devices, the game input is handled with virtual buttons and gestures, but you can play with a gamepad too. This mode only requires a keyboard. There are two keyboard settings which you can use or alternate whenever you want (WASD or Arrow keys). This mode is the most complete at this moment because it's the only one supported in the level editor. We're working on breaking the other mode limits editing levels, but this will be the most comfortable anyway for sure! 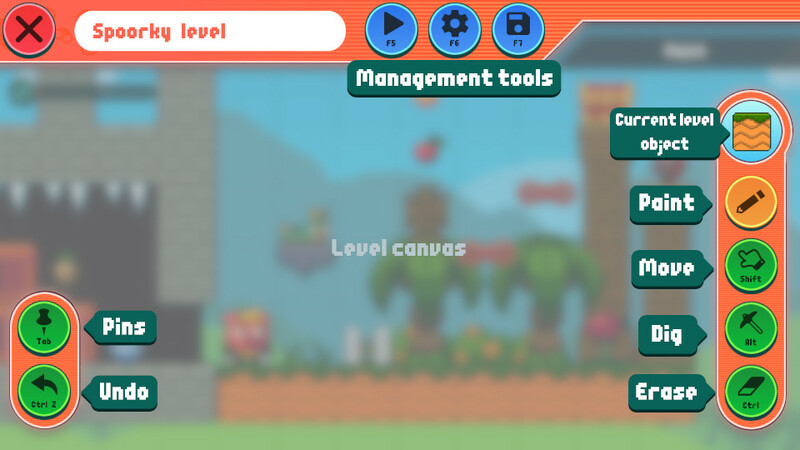 Go to the Level editor section to read more about the game input in this mode. 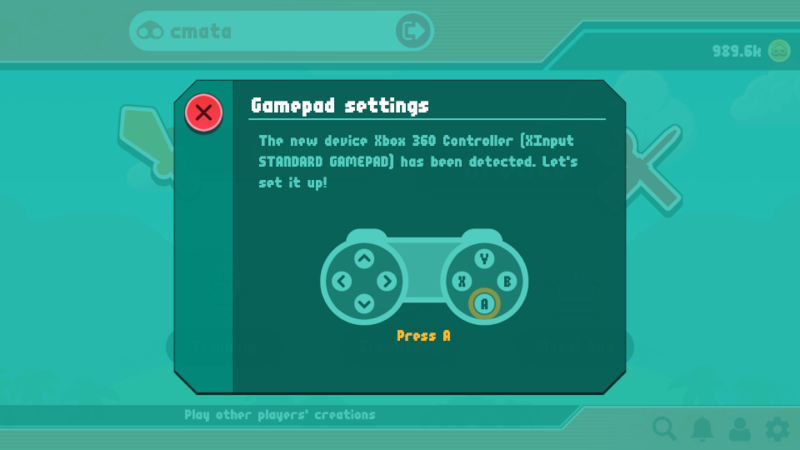 Spoorky is compatile with all kind of gamepads as long as your OS recognize them. The first time you connect a gamepad, an in-game setup wizard will start. 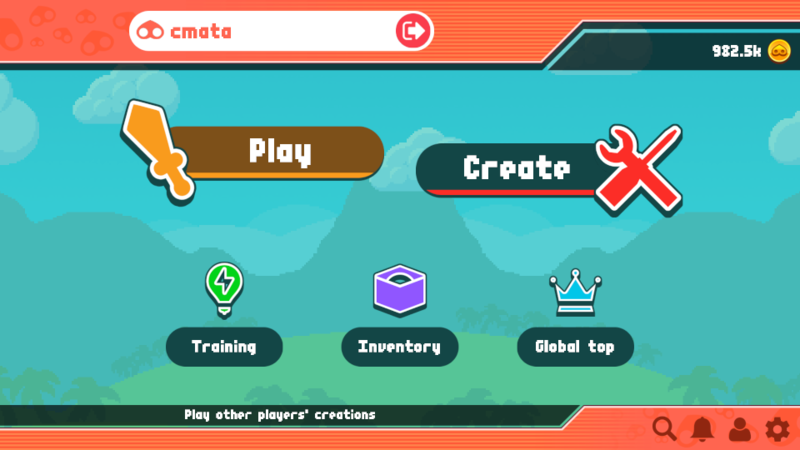 You can also restart this service in the Game settings menu (main menu, bottom-right). This action will take just 5 seconds! You'll need to press the four face buttons of the gamepad as the wizard ask you to ensure all kind of gamepads work as expected. This item will add global game score to your profile. 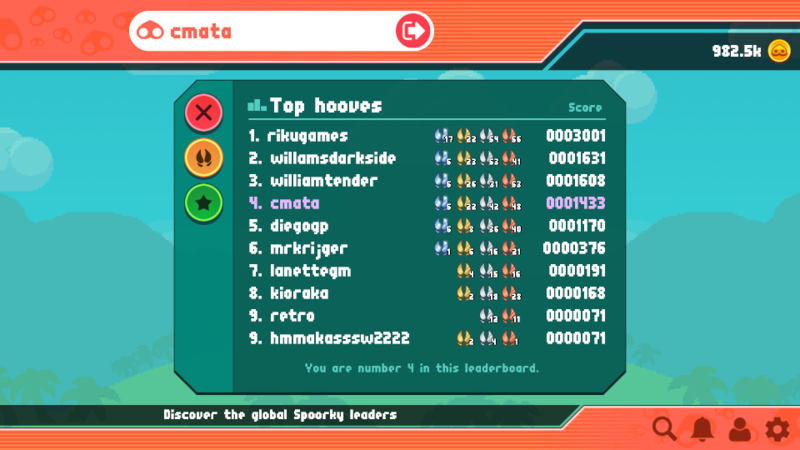 All users compete in a global score leaderboard, so they look for Spoorky Hooves playing and creating levels. Please, take a look at the following table. Getting all the cake portions in a level. Online or Training mode. Top 30 in the Weekly Challenge leaderboards. Beating the level creator score. Recovering the first place in your own level. Completing a world in Training Mode. Top 15 in the Weekly Challenge leaderboards. Your level has been chosen for the Weekly Challenge. Top 5 in the Weekly Challenge leaderboards. Lead a Weekly Challenge level (first place). Badges bestow special powers for a limited time when playing levels. They can help you to complete a hard level or make it even more challenging to get more score. You'll find badges in treasure chests. You can also buy them, but only badges you have seen before will be available. Discover new badges playing and looting levels. TIP:You can only use 3 badges per level session. Open the pause menu (ESC or Start) and select Badges. Note that triangle-shaped badges will reduce your final level score. This is the currency in the game. You'll need them to purchase new level objects and other stuff (badges, tickets, upload quota). You'll get coins if you complete a level which you didn't do before. You'll get a variable coin amount depending on the cake portions you got. Just try to get all the cake portions before catching the crystal acorn. You'll get extra coins in treasure chests. The Weekly Challenge levels contain more coins that the standard ones. You can continue your game everywhere with an Smartphone. To do this, you'll need to set a password in the Profile settings (user icon in the bottom side of the main menu). Once you set a password, select "Continue" in the new device and your game will be loaded! 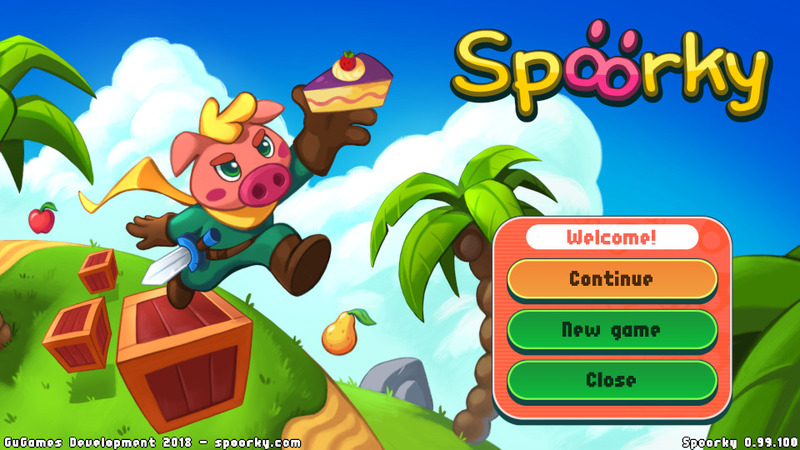 The Spoorky main menu will appear after signing in and completing the first two levels of Training Mode. All the game options are here. Lets' discover all about the game menu! TIP: Close the game by clicking on the log-out button close to your username/pressing the escape key/B-button to ensure you can continue your game in case you link your account on multiple devices. Search. Find users and levels using their ID. You cannot use the level name. The User ID is the nickname, the Level ID is the small alphanumeric code appearing in the level info (like 1T, 2N...). Notifications. When other users interact with you (follow) or your levels (share, steal your leadership, etc), you'll receive in-game notifications that will be listed here. User profile. All your information and account management options are here. We recommend to set a password to recover your account in the future and play on multiple devices. Game settings. Configure the game graphics, audio and gamepads. You can compete against other players and discover new adventures in this menu. 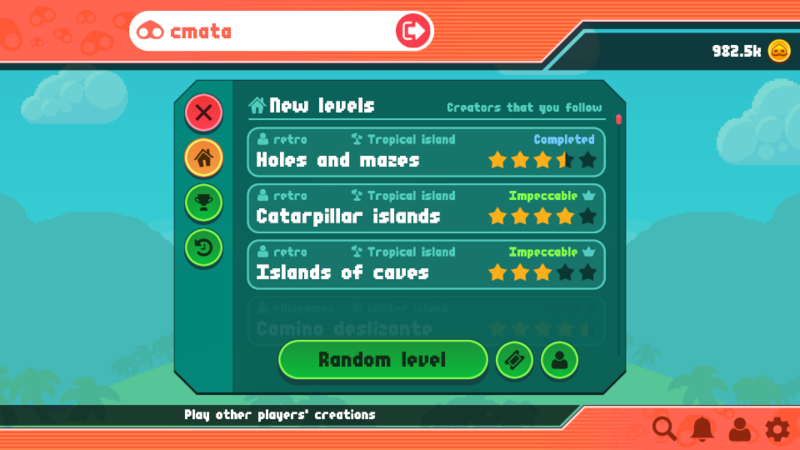 But it also includes your played levels history and a level timeline with the latest creations of users you follow or levels from other players they shared. This option will choose a random level for you. Note that you'll need to complete the first Training mode world in order to play levels rated as difficulty greater than 3 out of 5. You can use game tickets to filter random levels according to multiple criteria. 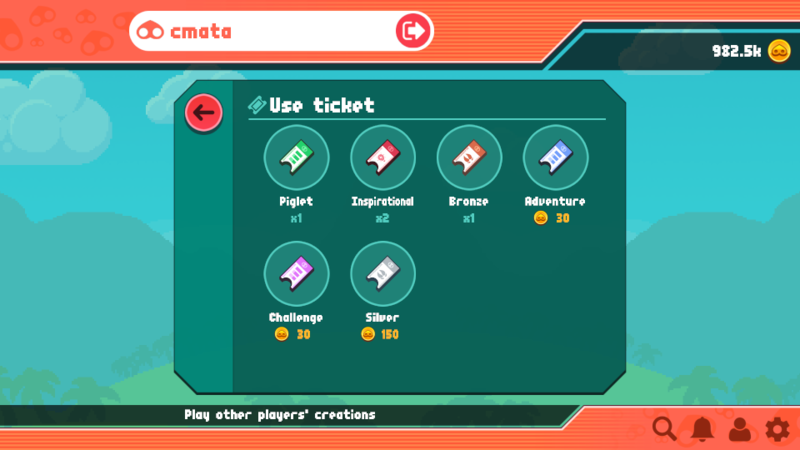 Select the option with the ticket icon in the Play menu to discover more. Please, se the Weekly Challenge section below. Use this function to replay levels. If you queue a level to play it later, it will be listed here for three days max. 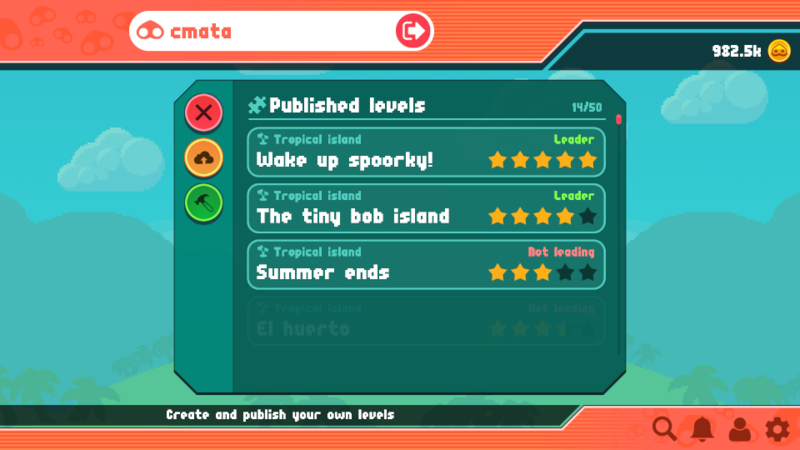 You can create new levels and monitorize your published levels' stats here. You'll know quickly if you are leading your creations. If not, you can recover the first place again and get a Silver Hoof as reward! Note that level drafts are saved locally until you decide to publish them. Be careful with removing the game data! Go to the level editor section to know more about this feature. All your items (badges and tickets) and level objects will be listed in this menu. If you want to add new ones, this is the place you were looking for! 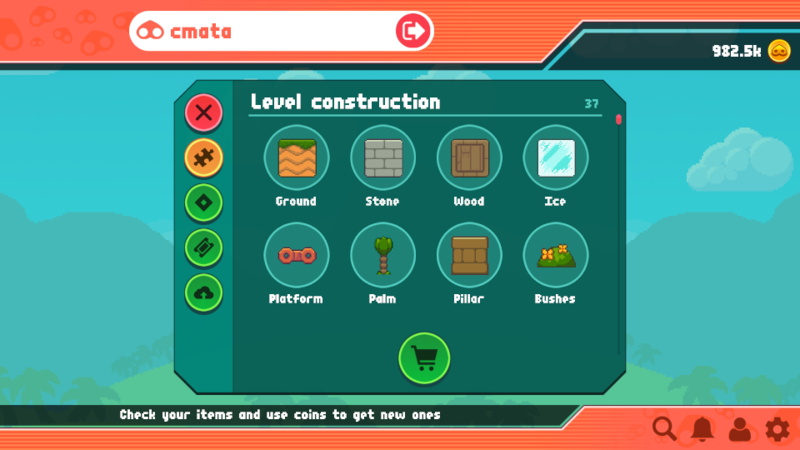 You can purchase new items, level objects and level upload quota using Spoorky coins here. Level objects. You'll only see the items from worlds you own. Complete a training mode world to unlock new level objects. Badges. You'll need to discover a badge before you can buy it in the inventory. You'll find badges in online levels, inside treasure chests. What's a badge? Badges bestow special powers for a limited time when playing levels. They can help you to complete a hard level or make it more challenging to get more score. Discover the global game leaderboards and compete against other players. All users get a global game score depending on the Spoorky Hooves they got. But this is not the only global leaderboard as creators compete with their level ratings. This is a nice place to discover interesting players and creators if you want to follow someone. Discover how to get Spoorky Hooves in the Spoorky Hooves section. Every week, players fight in the best levels according to the community ratings. Note that you'll obtain more coins in this mode. Important: you'll need to complete the first world of Training Mode in order to join Weekly Challenge. You'll only get the most valued Hoof in each level, they are not accumulative in the same leaderboard. 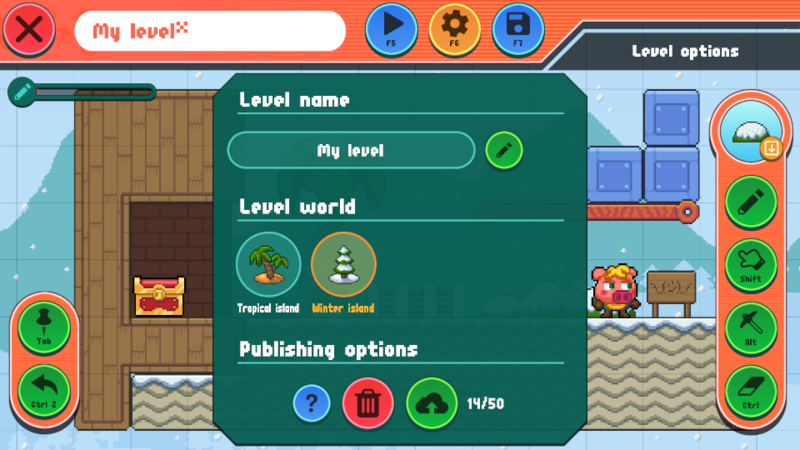 You can create and upload your own adventures using the Spoorky level editor. You'll find tis feature in the Create option of the main menu. Let's talk a bit about it! Creating levels in Spoorky is very easy! You just need to paint the level with your mouse or finger (not drag and drop). DESKTOP: Move easily across the level canvas using the mouse right button. Zoom in and out with the mouse scroll wheel. To erase objects, you can change the active tool by pressing CTRL. MOBILE: Move easily across the level canvas and zoom out/in using two fingers gestures. Your level includes all the required objects: Spoorky character, treasure chest, three cake portions and the crystal acorn. Place these in your canvas to publish. Minimun distance between special objects: there should be a minimun of 5 cells between the previous objects. Limited object count: there is a limit amount of items. Check the draw info bar on the upper-left side of the screen. Let's talk about the right tools module. This will be the one you'll use most: you can select an object to draw and paint it, erase objects, dig solid blocks or move them. Click on the current level object icon to display the list of available items. You can get more in the inventory menu and unlock content in Training Mode. 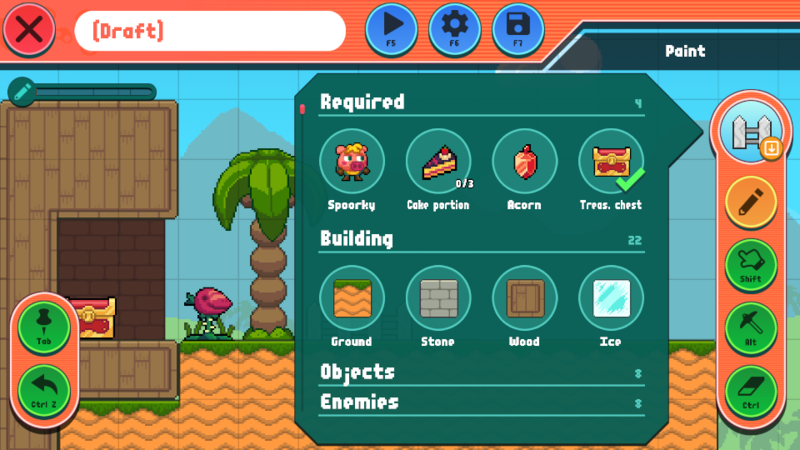 Note that level objects have some requirements depending on their nature. For example, bushes, grass or the treasure chest must be on a solid block. They cannot be placed in the air! When you select an object, you can draw it in the level canvas moving your mouse (left button)/finger. Some level objects are not compatible in the same place. In this case, the game will override the old one. Use this tool to select an object of the canvas and move it to another position. This tool will select the nearest depth object. Use this tool to create tunnels and other buildings inside solid blocks. When you select this tool, the non-compatible items will fade. This tool will act as eraser if the current structure cannot contain any tunnels. Be sure to not use this in corners. Use this tool to erase any level objects you want. Use the options on the top bar to save your level draft, test it locally when you make any changes and publish to the Internet. You should use this option to ensure that the objects you include in your level work as expected. Is not required to test the full level: place Spoorky in the test area and press the play button. TIP: Test your levels well before publish as they cannot be edited later. If you want to design a good level, you must check that the area you are creating is not accessible from an alternative way that you didn't want to. Use this option to change the level name, select a thematic world and publish on the Internet or remove the draft. Use this option to save the level changes locally. Finally, we'll talk about the left side tools. Use this tool to navigate on your level quickly. The special items are pinned by default, so if, for example, you want to take a look at the chest area, just open the pins menu and select the treasure chest to set the camera position there instantly. In addition, you can add pins where you want. Select the "+" button in the pins menu to add the current camera position and give it a name! Undo the last change you did. Si tienes alguna pregunta o problema con este título, estaremos encantados de ayudarte en Twitter, Facebook o vía email. También podemos atenderte en las redes sociales. El software, incluyendo este sitio web, pertenece y está desarrollado por GuGames Development (Cristóbal Mata, Jaén, España). Queda prohibido el uso de los recursos y productos creados y publicados por GuGames Development sin el consentimiento explícito del mismo salvo en casos de prensa o uso personal.